Our Warbird Group meetings are held at the Stockton Field Aviation Museum 7432 CE Dixon St., Stockton Metro Airport, on the third Wednesday of each odd month at 7 PM. This means that the meetings are in March, May, July etc on the third Wednesday. Please note that the group has decided to cancel the January meeting as it is too cold for our older members. Please join us as there is no admission charge. We also have an annual BBQ during the meeting in September and that meeting time is usually an hour early at 6 PM but be sure to check back here for the latest dates and times. c 1939 I became interested in aviation just before and during the Battle of Britain. I began building and flying model airplanes – an activity that continues today. 1949 After high school graduation, I joined the Air Force Reserve at Hamilton Air Force Base. Served as an airborne radio operator in C-46 Commando Aircraft. I also flew in AT-6, AT-7 and AT-11 aircraft. 8 June 1956 Graduated from San Jose State with a BA degree in aviation and a commission in the USAF. 6 Mar 1959 I passed the flight check for a private pilot certificate ASEL. 28 July 1961 Reassigned to James Connally AFB after Harlingen AFB closed. Served as instructor and flight examiner for DR, day and night celestial and polar grid navigation. I continued to fly with the Connally Aero Club in Cessna 150, 172, 182 and T-34 A, becoming a check pilot in the T-34 and secretary of the Aero Club Board of Governors. 7 Apr 1965 Reported to 35th Troop Carrier Squadron at Naha, Okinawa as navigator and instructor in Lockheed C-130 A aircraft. For the next 3 years and 2 months I flew 255 combat missions and 755 combat hours over North and South Vietnam. Returned to the US 21 June 1968. 29 Aug 1968 Reported to Aerospace Rescue and Recovery Training Center, Eglin AFB, Florida as instructor/standardization flight examiner in HC-130 H/N/P aircraft. 26 Dec 1979 Passed Assistant Flight Instructor check Part 141, Bud Andersen ,Sac GADO. 16 Oct 1997 Received a special issuance Class III medical certificate. I resumed flight instruction at Skywalk and flew another 1000 hours before officially retiring from active flight instruction on 1 June 2002 after 24 years. THE WWII WARBIRD GROUP IS A GATHERING OF AVIATION ENTHUSIASTS THAT GET TOGETHER EVERY OTHER MONTH AND SHARE STORIES AND EXPERIENCES ABOUT WWII AND OTHER AVIATION TOPICS. THE MEETINGS ARE HELD AT THE STOCKTON FIELD AVIATION MUSEUMS HANGAR AT STOCKTON AIRPORT IN CALIFORNIA. THE MEETINGS ARE OPEN TO THE PUBLIC (MEMBERSHIP NOT REQUIRED) AND FEATURE A GUEST SPEAKER WHO FLEW IN ANY OF THE MILITARY SERVICES DURING OUR NATION'S CONFLICTS FROM WWII TO PRESENT DAY. MEMBERSHIP IS OPEN TO ANYONE WHO MAY HAVE AN INTEREST IN MILITARY AVIATION REGARDLESS OF THEIR MILITARY SERVICE, NATIONALITY OR GENDER. YOU ALL ARE WELCOME SO PLEASE COME OUT AND JOIN US FOR AN INTERESTING AND ENTERTAINING EVENING. WE ALSO HAVE SPECIAL EVENTS SUCH AS BAR-B-Q'S AND THE OCCASIONAL AIRSHOW OR OPEN HOUSE. IF YOU KNOW ANYONE WHO MAY BE INTERESTED IN ATTENDING OR JOINING THIS GREAT GROUP PLEASE SEND THEM OUR WAY. THE WORLD WAR TWO WARBIRD GROUP MEETS BI-MONTHLY (MARCH, MAY, JULY, SEPTEMBER, AND NOVEMBER) ON THE THIRD WEDNESDAY OF THE MONTH AT THE STOCKTON FIELD AVIATION MUSEUMS HANGAR AT 7PM. REMEMBER THAT YOU DON'T HAVE TO BA A MEMBER TO ATTEND THE MEETINGS SO GRAB A FRIEND AND COME ON OUT. FROM HIGHWAY 99 NORTH TAKE THE FRENCH CAMP EXIT AND HEAD WEST. TURN RIGHT OR NORTH ON AIRPORT WAY. TURN RIGHT ON STIMSON (AT THE NATIONAL GUARD) AND FOLLOW IT TO THE END WHERE YOU WILL SEE THE BLUE MUSEUM HANGAR ON YOUR LEFT. THE ENTRY DOOR IS ON THE BACK OF THAT HANGAR. FROM HIGHWAY 5 NORTH OR SOUTH TAKE THE FRENCH CAMP EXIT AND HEAD EAST FOR A FEW MILES. TURN LEFT OR NORTH ON AIRPORT WAY. TURN RIGHT ON STIMSON (AT THE NATIONAL GUARD) AND FOLLOW IT TO THE END. ON THE LEFT YOU WILL SEE THE BLUE MUSEUM HANGAR ON THE LEFT. THE ENTRY DOOR IS ON THE BACK SIDE OF THE HANGAR NEAR THE PARKING LOT. The stories of 15 Central California flyers in World War Two are told in this book. Paper back, 138 pages, 8 x 11 inches. Compiled and edited by John V. Schippers, published 2002 by the WW II Warbird Group, Inc. 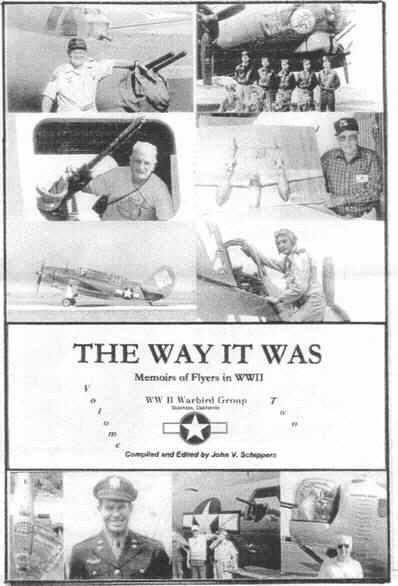 Quotes from stories in "THE WAY IT WAS, Memoirs of Flyers in WW II, Vol. 2"
Quote from Bill Behrns, P-38 pilot, CBI: "I rolled over and rolled out on the target coming down with throttle wide open. Apparently I was looking right down the barrel of an ack-ack gun. All of sudden, BOOM! -- the whole airplane jumped and everything went dead." Quote from Bill Gaines, B-17 pilot, 8th AF: "One of the other tough missions we had was bombing Munich Greens airfield with frag bombs. ....we got beat up pretty bad and had to make another forced landing. On that one I left the plane in Brussels. The two outboard engines were shot out and we landed with the two inboard engines. Fighter planes escorted me almost all the way in or I wouldn't be here talking."